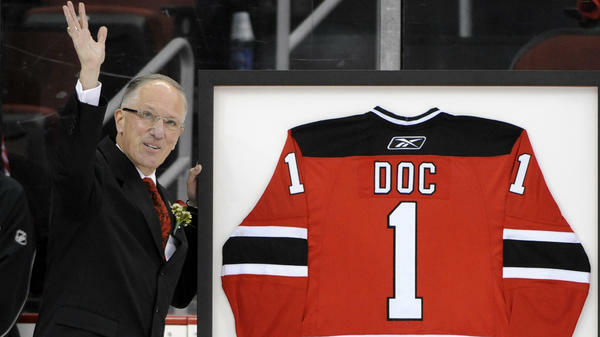 Sports commentator Mike "Doc" Emrick waves to fans as he is presented with a jersey by the New Jersey Devils in 2012. Even if you're a fairly enthusiastic sports fan — someone who can identify sportscasters Jim Nantz or Joe Buck by tenor and intonation alone — you may very well have never heard the name Doc Emrick. Mike "Doc" Emrick is the world's premier announcer for what is America's fourth team sport: ice hockey. For those who know hockey, or those aficionados who listen to a few minutes of an NHL game just to hear Emrick talk about blue lines or poke checking, he is absolutely revered. Emrick isn't even Canadian, and his background is in academia — hence the professorial nickname — but he is that rare play-by-play man who is both an authority on the game and a connoisseur of the language. The eloquence he brings to such a bombastic activity is the sort of giant contradiction that even overwhelms irony. Hockey is surely as fast a game as any — but somehow, even during line changes, or the chaos of a scramble for a puck behind the cage, Doc is able to speak in coherent sentences, complete with subordinate clauses, even turning a clever phrase as the puck clears, and he is able to catch his mind. A devoted fan once counted 153 verbs that Doc used in one game to describe the movement of the puck. To hear more on Doc Emrick from Frank Deford — and a sample of those 153 verbs — click on the audio link. OK, you should also listen to this. INSKEEP: That is the sound of a sports legend at work. It's hockey announcer Mike Emrick. Our very own sports legend, Frank Deford, has this appreciation of a living legend. FRANK DEFORD, BYLINE: As a general rule, over time, venerable national play-by-play announcers cannot help but attract criticism - the classic case of familiarity begetting contempt. Besides, it's everywhere assumed that these overpaid golden throats are obviously prejudiced against our team. The exception is Doc - yes, Doc. Doc - even if you're a fairly enthusiastic fan, someone who can identify Jim Nantz or Joe Buck just by tenor and intonation alone - you may very well have no idea who I'm referring to when I say Doc. This is because Doc Emrick is the world's premier announcer for what is America's fourth team sport - the one that doesn't get on the podium - ice hockey. But for those who know hockey, or those aficionados who listen to a few minutes of an NHL game just to hear Doc Emrick talking about blue lines or poke checking, he is absolutely revered in that rare category of celebrities that include the likes of Betty White, the Duchess of Cambridge, Tony Bennett or Pope Francis, who simply are adored above rebuke. Mike Emrick isn't even Canadian, and his background is in academia, hence the professorial nickname. But he is that rare play-by-play man who is both an authority of the game and a connoisseur of the language. The eloquence that he brings to such a bombastic activity is the sort of giant contradiction that even overwhelms irony. But somehow, even during the line changes, with the chaos of a scramble for a puck behind the cage, Doc is able to speak in coherent sentences, complete with subordinate clauses, even turning a clever phrase as the puck clears, and he is able to catch his mind. A devoted fan once counted - and are you ready for this? - 153 verbs that Doc used in one game to describe the movement of the puck. Despite the fact that Emrick is not that well known even to large segments of the sporting public, he's begun to earn the praise he deserves. I happened to be backstage at the Sports Emmy Awards in 2011 when he won the Emmy as the nation's finest play-by-play announcer. And I could not help but notice the expression of gracious wonder on his face, not only that he had been honored, but that he had done it for his often overlooked game. INSKEEP: You can hear the comments of Frank Deford here every Wednesday. DEFORD: ...Collared, come up, controlled, curled, cut, dealt, deflected, directed, dished, dropped, drubs, dubbed... Transcript provided by NPR, Copyright NPR.